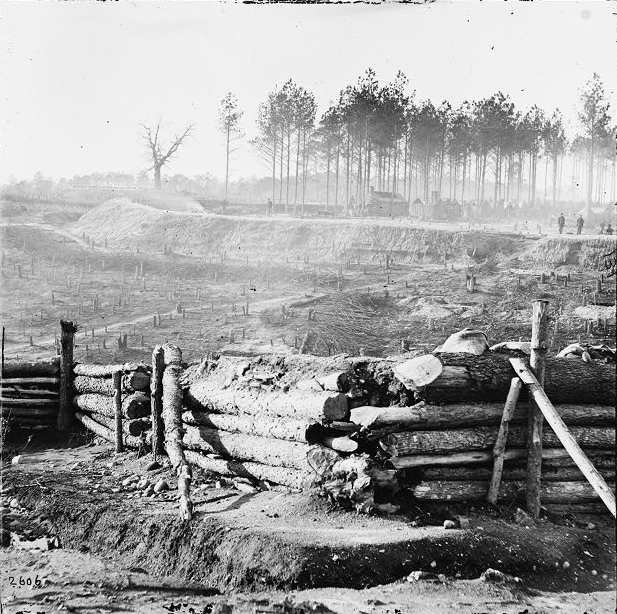 Thomas Moore and his regiment served behind breastworks much like these on Bermuda Hundred. In a series of posts taken from 1953 issues of the Sandy Creek (NY) News, you’ll be reading about one Thomas Moore, a soldier in Benjamin Butler’s Army of the James who fought at the Siege of Petersburg. Three articles in this series focus on his time at Bermuda Hundred, both before and during the Siege. These articles will appear below as they are published over the next three Wednesdays. Thomas Moore’s regiment is never specifically stated in this series but there are plenty of clues throughout the articles, so I thought I’d do a little digging to see if I could figure out just what unit Moore fought with. Armed with this information, we need to see if we can narrow this down to the Thomas Moore mentioned in the Sandy Creek (NY) News. The Union and Confederate lines on Bermuda Hundred. Thomas Moore would have spent a good deal of time during the Siege of Petersburg in this area. Notice the main Union supply depot at City Point on the James River. Richmond was to the north up the James River, while Petersburg was to the southwest up the Appomattox River. Clue #3: Thomas Moore was 16 years old when he signed up as a Union soldier in 1862. …the Thomas Moore who was the subject of this series of articles was 16 years old when he enlisted in the Union Army in 1862. 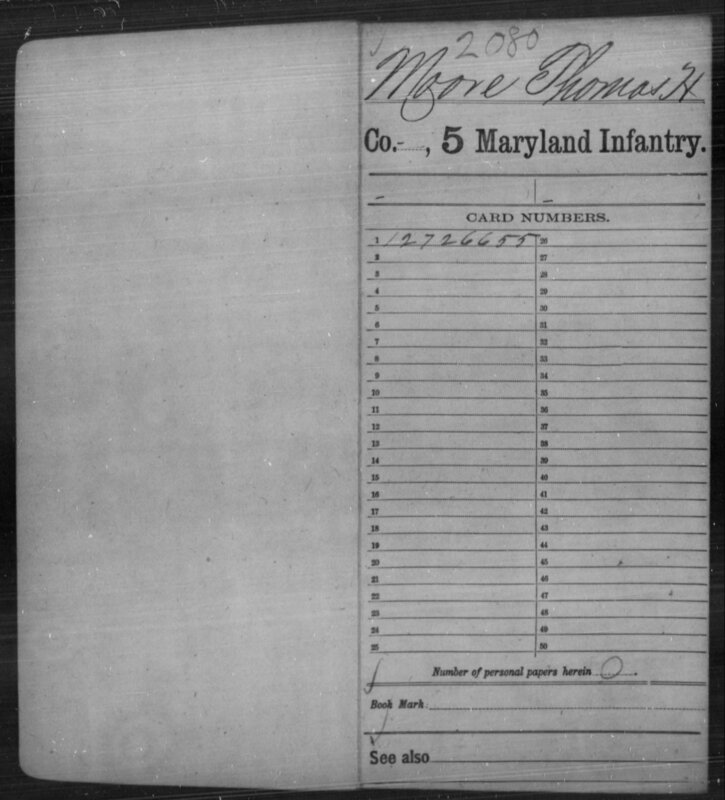 And the Thomas Moore from Co. M, 5th Maryland Infantry had an image in his Compiled Service Record which showed descriptive information, which includes his age when he enlisted. I simply took a look at the above image to compare this Thomas Moore’s age with that of the Thomas Moore featured in the articles. They didn’t match. The Thomas Moore who fought for the 5th Maryland Infantry was 29 when he enlisted. Given the large age difference, this couldn’t be a mere clerical error. After a thorough search of the rest of the OOB, I found no mention of the 8th Connecticut. This looked like I had finally found my man and his unit, but I wanted to run a few more checks to make sure everything fell into place. Organizations to which the 8th CT was attached: Organized at Hartford September 21, 1861. Left State for Annapolis, Md., October 17. Attached to Parke’s Third Brigade, Burnside’s Expeditionary Corps, to April, 1862. 1st Brigade, 3rd Division, Dept. of North Carolina, to July, 1862. 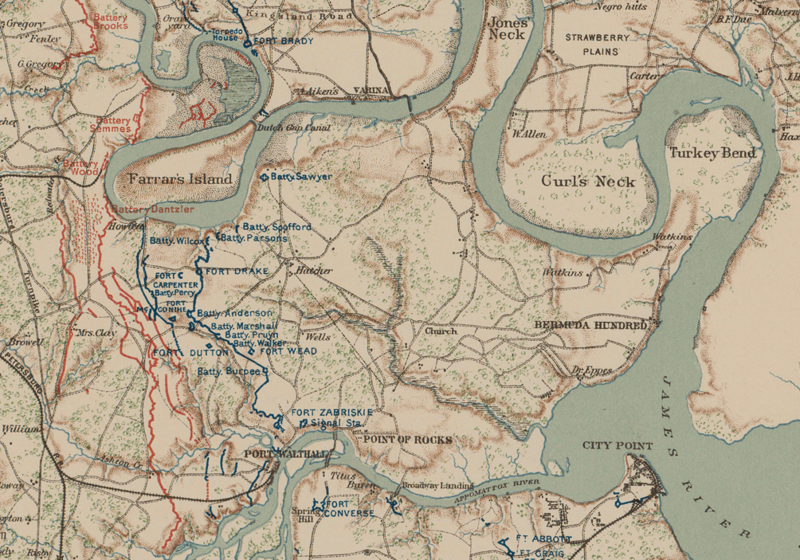 Battles/Movements: Burnside’s expedition to Hatteras Inlet and Roanoke Island, N. C., January 7-February 8, 1862. Battle of Roanoke Island February 8. At Roanoke Island until March 11. Moved to New Berne, N. C., March 11-13. Battle of Newberne March 14. Operations against Fort Macon March 23-April 26. Skirmish Fort Macon April 12. Capture of Fort Macon April 26. Duty at New Berne until July. Moved to Morehead City July 2, thence to Newport News, Va., July 3-5 and duty there until August 1. With the aid of Fold3.com and its Compiled Service Records, this clue had the potential to be the clincher, if only there was a Walter Moore in the same regiment as Thomas Moore. As we saw earlier, the Thomas Moore who served in the 96th New York was part of Company K. If I could find a Walter Moore who served in the 96th New York, or even better in Company K, we have nearly conclusive evidence as to the identity of the soldier we were looking for at the outset of this search. Clue #6: Thomas Moore’s hometown was Ellenburg Depot, New York. MOON, THOMAS.—Age , 18 years. Enlisted, February 1, 1862, at Ellenburg, to serve three years; mustered in as private, Co. K, February 6, 1862; discharged, February 8, 1865, at Chaffins Farm, Va.; also borne as Moore. At first glance this entry doesn’t seem like a hit. The age is wrong, 18 years to 16. So is the name, Moon rather than Moore. However, a little intuition and a closer glance at the tail end of the entry helps to convince me that we’ve got our man. First, let’s discuss the age. Thomas Moore’s recollections seem to have been written long after the war. Perhaps he did believe he had enlisted at age 16. Or perhaps he lied to authorities about his age to guarantee entry into the war. In either case, the age is close enough to make it a potential match. Second, let’s cover that last phrase, “also borne as Moore.” Rather than this entry being for Thomas “Moon,” it actually refers to Thomas Moore. Perhaps the person reading some of the records misread cursive handwriting of the time, or perhaps there was a clerical error. In any case, this man was named Thomas Moore. Third, let’s discuss where Thomas Moore (or “Moon”) enlisted: Ellenburg, New York. It’s a match with the hint of Thomas Moore’s hometown in the Sandy Creek News. Given all of the above information, it seems like this MUST be the Thomas Moore referred to in the articles. After starting a search for what I thought might be a needle in a haystack, I have come out of this little exercise feeling almost certain I’ve found my man and his regiment. I like to shed light on soldier reminiscences wherever I can. It is always rewarding to put a name and a regiment (and where extremely lucky, a face through a period photograph) to these memories of the Siege of Petersburg. Knowing who this man was and where he came from adds to the story and helps those interested in the common soldier do even more research if they feel inclined to “pull this thread” and see what became of Thomas and Walter Moore in the postwar years. I’m happy to have found the object of my search i order to provide a little more context to a fascinating story, one of thousands at the Siege of Petersburg. Stay tuned here for much more, and be sure to read the three articles on Thomas Moore’s experience at the Siege of Petersburg mentioned at the top of this article.